My trip to East Timor required me to have a considerable transit time in the island of Bali in Indonesia. It was a great stopover point, as the island offered so much variety for any type of traveler. There are numerous beaches, majestic volcanoes, old temples and a culture that uniquely belongs to the 3.5 million people inhabiting the island. It is no surprise that Bali is the most popular of Indonesia’s 17,000+ islands and has gained international, first name familiarity. People rarely say “Bali, Indonesia” and simply utter the mellifluous sounding “Bali.” The name is synonymous with relaxation, and rightly so. The flight to Bali from Singapore took about two and a half hours. The plane touched down with the air stewardess chirping – “we hope you enjoy your holiday in Bali,” indicating that the island is a purely leisure destination. The Ngurah Rai International Airport reflected this mentality – the terminal was made to resemble a traditional Balinese temple with gamelan music blaring from the speakers to boot. It reminded me of Angkor Airport in Cambodia, except that the former looked just a bit less touristy. After clearing immigration, I got my backpack and went straight to the Merpati office to buy my ticket for East Timor. After this, I was off to Ubud where I decided to stay for the night. I made a detour before reaching my guesthouse and stopped by the Elephant Cave and Gunung Kawi. Though billed as part of the island’s top attractions, I was a bit disappointed. 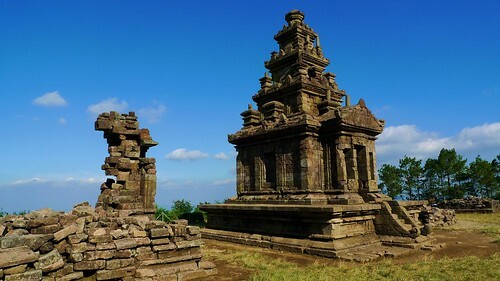 Both paled in comparison with the ruins in Central Java, not that they were fair comparisons to begin with. On the bright side, there were some picturesque rice terraces on the way down in Gunung Kawi and tourists could still see glimpses of traditional life. I then checked in at my guesthouse – Teba House. My choice of accommodation was a simple, no frills option. The room had nothing but a bed, small cabinet and table, as well as an attached bathroom but nothing else apart from that. What blew me away however, was the personalized level of service which I don’t get even in better lodgings. I was on a first-name basis with the owners as well as the staff. They were also very helpful in giving me suggestions on places to see and things to try. I left for East Timor early the next morning, but returned 4 days later. On my return, I first went to Kuta – perhaps the most touristy spot in the island. Its beaches, though nothing spectacular, offered waves that are good for surfing. It is also an excellent transit point for tourists on the cheap who couldn’t be bothered hiring a private car or taxi to take them farther afield. 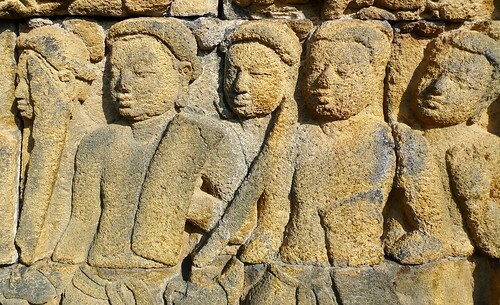 I was one of these people, and I took the Perama bus to Ubud (1.5 hours for 50,000 rupiah). Inside the bus, I chanced upon a solo traveler from China who was struggling to ask the bus driver in English about her hotel. I helped her, mustering whatever basic Chinese I know and translated her conversation with the driver. We ended up traveling together later that night and the next day, sharing a car which brought us to Taman Ayun, the scenic Pura Ulun Danu Bratan temple and Tanah Lot for sunset. Gedong Songo is probably one of those places tourists in Central Java wouldn’t think of venturing into. Few people know about the place, and there is only a brief mention in the guidebooks about this hidden gem. If it weren’t for the pictures I saw in an online forum a few weeks prior to our Yogyakarta trip, I would not consider going their either. The trip – though long, tiring and winding – proved to be a rewarding one. Gedong Songo is literally translated as “nine temples” and that’s exactly what visitors see. The temples themselves are small, and scattered all over the place but it is the setting – on hills 900 meters above sea level – that makes the place a must for any Central Java itinerary. The resort is about 8 celsius cooler than Yogyakarta, making it such a refreshing change from the tropical humidity. All around we could see verdant hills, vegetable terraces and humble farmers ekking out a living from the land. The place was almost completely deserted of western tourists. We had a horse ride (IDR 50,000) that took us to all the 9 temples, each with its own unique scenery. There is also a hot spring located between the temples which makes the place even more charming. Just before the path to the last temple is a wide grass field that is very suitable for contemplating. It’s a very idyllic scene with views of Mt. Ungaran and the surrounding volcanoes of Central Java. I couldn’t imagine a better place to just sit and relax. How to get there: The easiest way to get to Gedong Songo is through hired car with driver. The site is about 2 to 2.5 hours from Yogyakarta and is a little less if coming from Semarang. 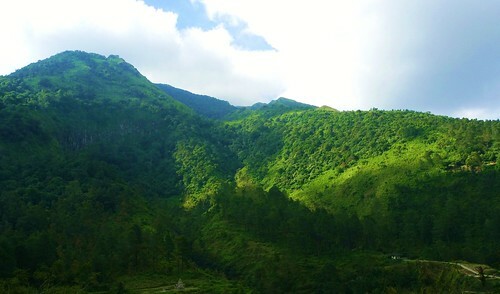 Gedong Songo is geographically closer to Semarang. one of the persistent vendors in gedong songo – she followed us all the way to the top! Ever since I came home from Angkor Wat nearly 2 years ago, I’ve been dreaming of doing the major Southeast Asian temple circuit one day and visit Borobudur as well as Bagan. Well, dreams do take a long time to be fulfilled. 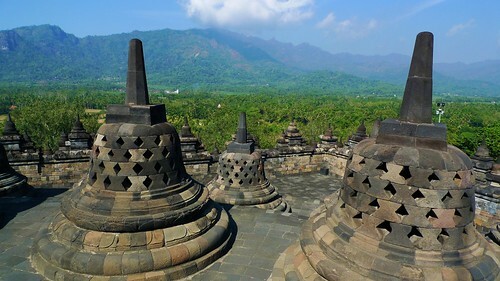 I’ve yet to venture out into Burma and I’ve only been able to visit Borobudur last July. And the latter truly did not disappoint. Good thing about this trip is that I had some friends who were also interested to go there. Well, they weren’t that keen at first! “Boro-whattt?” is what I heard in the beginning but after showing them some pictures of the place, it didn’t take much convincing! It was also a good thing that Air Asia started a direct service between Singapore and Yogyakarta just a few months back and the ticket prices were very reasonable. So there was really no way I would NOT go there under such circumstances! 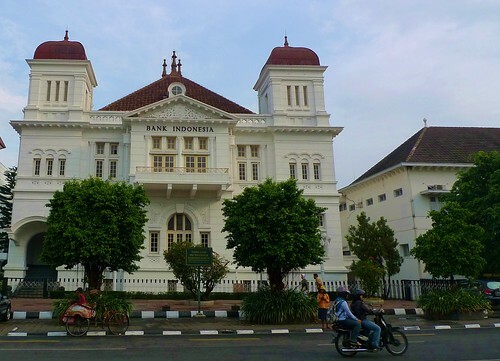 We took the two hour flight to Yogyakarta and arrived in the city at about noon. The queue in the immigration counter was very long, and each and everyone was subjected to the anti-H1N1 virus spray. After being cleansed by the spray and having our passports stamped, we boarded a taxi (fixed at IDR45,000) bound for Novotel, which was our accommodation for the trip. It was a good thing too that we got our room for only around US$55 – a steal for a hotel of its standard. After getting the keys, we basically just dropped our bags and went to have a late lunch in the mall next door. It started to rain a bit after, but that didn’t deter us from checking out the Kraton. The sultan’s palace, which is located in the central part of Yogyakarta, was a bit of a let-down. It didn’t look like a palace at all, and seemed a bit run-down. There was a tout who tried to persuade us to go to a batik showroom. We later learned that this was a common modus operandi in the area, so good thing we politely said goodbye to him when things looked suspicious. Later on, we took a 40-minute taxi ride to Prambanan. 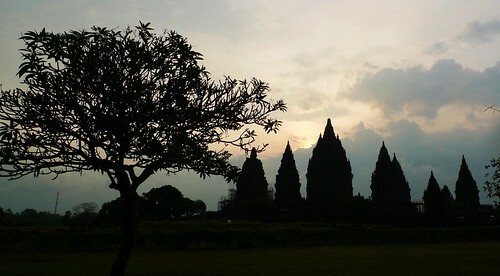 The complex reminded me a bit of Angkor, although Prambanan certainly looked more well-maintained. I could see more of the finely-chiseled carvings jutting out of the temple walls. It was an amazing sight, except that the rain spoiled our view and the sky was a dull grey. We took snapshots here and there and ended up being the last visitors to leave the complex. We had to walk a long distance until we found the bus that took us back to the city. But their buses are admittedly quite clean and modern – it is also cheap! The next morning we woke up early to venture into Borobudur. We didn’t plan on going there for the sunrise but we wanted to be there early as we had a tight schedule that day. Our driver showed up with the Toyota Innova (IDR 500,000 for the day including gas) as agreed. The drive was quite pleasant. We passed by small towns and rice fields during the 1 hour trip to the temple complex. The first thing I noticed when I saw Borobudur was its massive size! For one single temple, it’s much larger than anything else I’ve seen. The bas reliefs were also quite detailed. Again, the temple looked more pleasing to me than the ones in Angkor. The monument has three levels – each symbolizing the 3 worlds (the world of desires, the world of forms and the formless world). It was a bit of a climb to the top, but the view was just marvelous. The highest level was filled with several stupas and one of them housed the “lucky buddha.” According to the locals, whoever could reach the buddha’s finger would be blessed with good luck. From the top, we could also see a bunch of volcanoes in the distance plus the ritzy Amanjiwo Hotel. It was a sight to behold and I could imagine what a relaxing place it could be if there were no crowds. Unfortunately, that was not the case during the time we went and almost every single corner of the monument was filled with people. It was a challenge just to take shots without anybody suddenly appearing in the corner. As we made our way to the exit, we were greeted by souvenir vendors who were probably the most persistent I’ve seen! They followed us all around and wouldn’t leave despite the many times I said that I wasn’t interested. My friends bought a few stuff. Come to think of it, maybe I should have brought something back, too. For what it’s worth, I was just so distracted then as my mind was occupied with the next place that we were going to. As mentioned, we stayed in Novotel Yogyakarta which cost us about US$55 which is a steal for a four-star hotel. The room was clean, spacious and painted with bright colors.